I recently purchased the iRobot 630 for Pets and it has gone above and beyond my expectations. I have an 80 lb. Lab and a huge longhaired cat, so I was skeptical of how this vacuum would handle all of the animal hair and dirt they track inside. I have to say this vacuum does a better job than I do manually vacuuming with my Dyson! My roomba carefully cleans along the baseboard and legs of furniture with her brush to remove any and all traces of pet hair, dust, and debris. As well, it has no problem cleaning an assortment of rugs including a large cowhide. The iRobot uses a zig zag type manuever to ensure all 1200 sq ft is perfectly clean. Cleaning the brushes and emptying the disposal unit is a breeze, and it keeps its charge for about 2 hours. After it has finished its cleaning cycle, or is tired the Roomba carefully docks itself back onto the charger. I would definately reccomend this product! I've got three Roomba 500s (a pair of 560s and a 570), and I love 'em. Rock solid reliable, easy to work on, and do a great job keeping my floors clean. 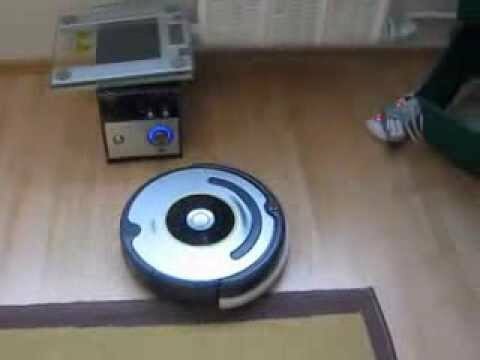 These Roombas aren't toys, they actually clean the floors. In fact I've gone behind them with my Dyson just out of morbid curiosity and all I got was an empty bin. Sure, a Roomba can't pick up as much dirt as a regular vacuum in one pass, but that's why they're programmed to cover the same area of carpet multiple times. And in some ways the Roomba is better than my Dyson. Why? * In the back corners of my closet where a regular vacuum can't go. * Underneath my reclining theater seats. * Under my basement work bench and utility sink. The 600s series is even better, as they include the Aero Vac dust bin, and the upgraded cleaning head module from the 700 series. The upgraded cleaning head module is a bit of a big deal, as it's designed to keep the bearing clean and should result in a much longer lasting robot. In fact just last month I had to replace the cleaning module on my oldest 560 as it had gotten gunked up and warped from heat. Easy to fix, but the replacement module and compatible brushes were about 70 bucks. So if you're considering an older 500 series Roomba to save a few bucks don't! * Only one invisible wall is included with the 630. * Unlike my oldest 560, and my 570, the 630 doesn't support lighthouses. * When you first get one you'll have to "Roomba-proof" your house. Meaning the robot will get caught on curtains, rug tassels, etc, and you'll have to fix or remove these obstacles. It's a simple process, but just be aware your robot will get stuck on some things at first. * The upgraded cleaning head module is nice, but why can't we get one with completely sealed metal bearings? The reason I think is that the robots would essentially last forever at that point and Roomba wouldn't make as much money.